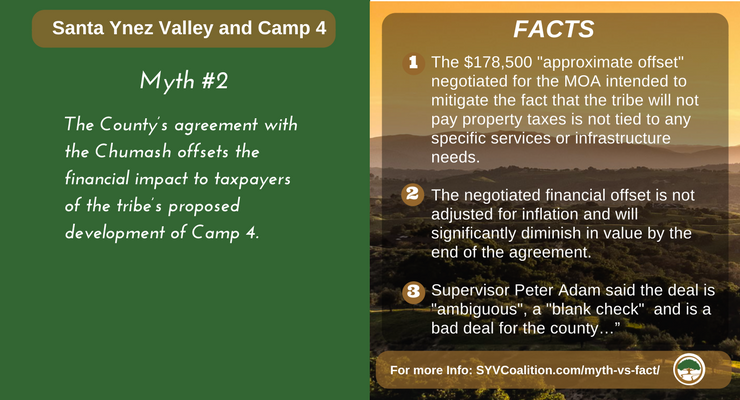 In the next of the myths vs facts series, we address the financial impacts to county taxpayers from Camp 4 development. Myth: The County’s agreement with the Chumash mitigates the financial impact of the tribe’s proposed development of Camp 4. The $178,500 “approximate offset” negotiated for the MOA is not tied to any specific services or infrastructure needs. For example, the property taxes for non-tribal residents on 143 houses on 1-acre lots would generate approximately $1,400,000 per year in annual revenues to pay for needed services and infrastructure. As is clear, the amount contained in the agreement falls well short of the comparable amount paid by non-tribal residents and that shortfall will be paid by non-tribal taxpayers. The negotiated financial offset is not adjusted for inflation and will significantly diminish in value by the end of the agreement. Assuming a conservative 2% annual inflation rate, at the end of the 23-year term, the value of the negotiated $178,500 offset will be less than $115,000 – a 35% reduction. For comparison, in 2016, the annual salary including benefits for Santa Barbara County employees is just over $115,000.